Courtesy Photo NOrthmor JOG students at the mulch pile filling up wheel barrows with mulch for the rope course. Courtesy Photo Alison Ivy watches as Ethan Fulk drops a load of mulch off for Alison to spread under the high ropes. Courtesy Photo Alex Crampton and Brandon Johns are listening to Mr. Hutch as he instructs them on mopping the floor in the lodge. 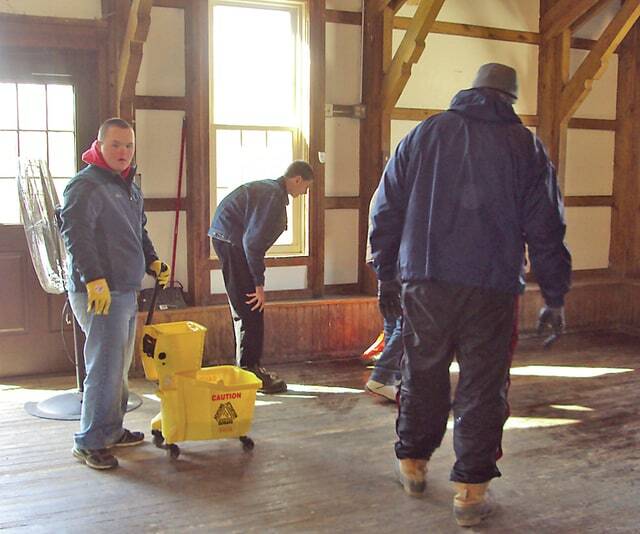 Northmor Jobs for Ohio’s Graduates made their yearly trip to help Camp Mary Orton get ready for the 2015 summer season. We had the honor of having Mr. Hutch’s students participating with us this year. This service project is one of our many activities that teaches the students teamwork, leadership, and giving back to others. It is a great volunteer work experience for the students. This year we were busy mulching underneath the rope course and cleaning up the lodge with washing windows and mopping floors. We had a great day to work outside. Camp Mary Orton was excited to see Northmor students come and volunteer as the students are hard working and dedicated with getting the jobs done. Northmor is the only school that is allowed to come and work at the camp because of their work ethics.